During the ovarian stimulation stage of in vitro fertilization treatment, the goal is to collect as many eggs as can safely be matured at one time. When the embryo transfer procedure takes place, however, only one, two, or three embryos will usually be placed into the uterus, often leaving additional embryos left over. Cryopreservation, or the low-temperature storage of living cells, allows us to save these extra embryos for later use. The criteria for freezing are very strict so most embryos on day five, six, or seven do not qualify. This technology is the basis for fertility preservation techniques. Contact us to learn more about the cryopreservation techniques available at our Chicago practice. Embryo freezing technology was developed only a few years after the first successful in vitro fertilization procedure. Since that time, the cryopreservation of extra embryos created through IVF has become a routine process that not only prevents the unwanted destruction of extra embryos but improves the efficiency of IVF treatment. The newer cryopreservation technique, vitrification (fast freeze eliminating ice crystals), leads to pregnancy success rates equal to or better than fresh embryos at Fertility Centers of Illinois. When vitrified embryos are used, the ovarian stimulation and egg retrieval stages are omitted, significantly reducing the cost and physical impact of the IVF cycle. In addition to embryo freezing, the cryopreservation of gametes (sperm and egg cells) is also available through our fertility centers. Egg freezing, by vitrification in particular, is a process that has been significantly improved in recent years, making fertility preservation a much more promising option than it was a short time ago. Egg freezing, utilizing the newer vitrification technique, is generally performed for women who are facing cancer treatment or have other medical conditions that threaten their future fertility. In some cases, it may be utilized for women 35 to 40 wanting to preserve their eggs for the future. The procedure involves ovarian stimulation and collecting the mature oocytes, then placing them in laboratory straws with a special solution that is very rapidly frozen before being stored in liquid nitrogen. When the patient is ready to use her eggs, they are thawed and fertilized. The resulting embryos are then transferred to the uterus, just as they would be during standard IVF treatment. Until recently, egg freezing by traditional cryopreservation was a difficult and unreliable process. The traditional slow-freezing cryopreservation technique used for sperm and embryos was problematic when applied to oocytes because it had a tendency to cause ice crystals to form, resulting in damage to the egg. The newer rapid-freezing technique, known as vitrification, makes it possible to freeze gametes and embryos so quickly that ice crystals do not form. Since researchers have begun using this method for egg freezing, the success rates have dramatically improved and the cryopreservation of oocytes has become a viable fertility preservation option. 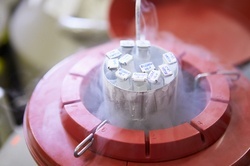 The cryopreservation of sperm is a common and well-established procedure that involves freezing processed sperm and storing it in liquid nitrogen. All donated sperm must be frozen and quarantined for safety. Cryopreservation is also an option for men who want to preserve sperm for later use. It is often used prior to chemotherapy, radiation, or vasectomy. Cryopreservation of sperm can also be useful during in vitro fertilization treatment to have a backup specimen in order to reduce anxiety during fresh collection, or if a testicular / sperm aspiration (TESE) is required. Contact our offices, serving Chicago and all of Illinois, to learn more about egg freezing, embryo freezing, or general cryopreservation methods.